Lead PIs: Dr. Sandra Brooke, Florida State University, Dr. Steve W. Ross, University of North Carolina, Wilmington, & Mr. Stephen Viada, Continental Shelf Associates, Inc. The Atlantic Canyons project brought together a team of collaborators (click here for full list of recipients) from private industry, government agencies, and academic institutions to explore and document the deep-water and benthic marine habitats of two mid-Atlantic Canyons located offshore of Virginia and Maryland. This effort involved research cruises to the Norfolk and Baltimore Canyons from 2011 to 2013 that found unexpected extensive deep-water coral ecosystems, identified over 125 species of fish, discovered large swaths of chemosynthetic mussel communities, documented historically important shipwrecks off the coast of Virginia, and deployed innovative sensing technologies on the canyon floors to monitor their oceanographic characteristics. Federal support for this project was provided by the Bureau of Ocean Energy Management (BOEM), the National Oceanic and Atmospheric Administration (NOAA), and the U.S. Geological Survey (USGS). In this effort, researchers completed a total of seven cruise legs with 90 at-sea days. The team conducted 414 hours of Remotely Operated Vehicle (ROV) dives and mapped 6,406 km2. An HD video documentary of the project that includes spectacular underwater footage of deep-sea coral habitats and the newly discovered chemosynthetic communities was completed in May 2015. Brooke, S., and Ross, S.W. 2014. First observations of the cold-water coral Lophelia pertusa in mid-Atlantic canyons of the USA. Deep-Sea Res. II. 104:245-251 . DOI: 10.1016/j.dsr2.2013.06.011. Obelcz, J., D. Brothers, J. Chaytor, U. ten Brink, S.W. Ross and S. Brooke. 2014. Geomorphic characterization of four shelf-sourced submarine canyons along the U.S Mid-Atlantic continental margin. Deep-Sea Res. II 104:106-119. DOI: 10.1016/j.dsr2.2013.09.013. Ross, S.W. , M. Rhode, A.M. Quattrini. 2015. Demersal Fish Distribution and Habitat Use Within and Near Baltimore and Norfolk Canyons, U.S. Middle Atlantic Slope 2015. Deep Sea Research I. 103:137-154. DOI: 10.1016/j.dsr.2015.06.004. Ross, S.W., M. Rhode, S.T. Viada and R. Mather. 2016. Fishes associated with shipwreck and natural hard bottoms on the middle to outer continental shelf of the Middle Atlantic Bight near Norfolk Canyon. Fishery Bulletin 114: 45-57. 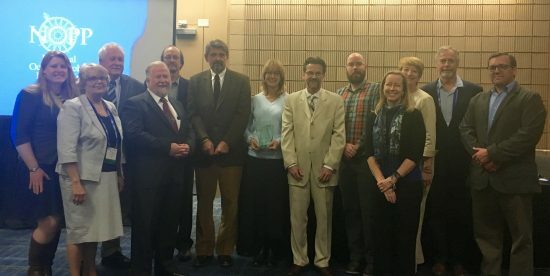 The NOPP Excellence in Partnering Award was presented to 54 collaborators of the Atlantic Canyons project at the 2016 Ocean Sciences Meeting in New Orleans. The NOPP Excellence in Partnering Awards Ceremony was held in the Ernest N. Morial Convention Center, Room 223, Tuesday, February 23, from 1:00-2:30 pm. Click here to download the official BOEM press release containing ceremony details.